This is a historic event here at SuperPhillip Central. 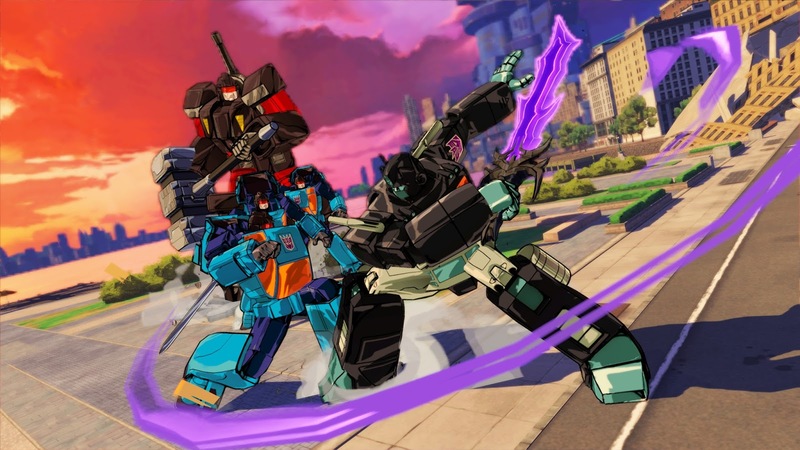 It's a twofer here, the site's first mobile and first Steam review! Check out the world of Oceanhorn: Monster of Uncharted Seas, and see if it's worth a look with SPC's review. If The Legend of Zelda and mobile made love, you'd get this game. One of my favorite video game franchises is The Legend of Zelda. I love the idea of exploring a vast world, entering puzzle and enemy filled dungeons, and collecting incredible items to help my hero's adventure along the way. Despite being a popular series, there are very few clones of Zelda nowadays. Back in the age of the original NES Zelda, there were some compelling clones, such as Crystalis and Beyond Oasis, for example. 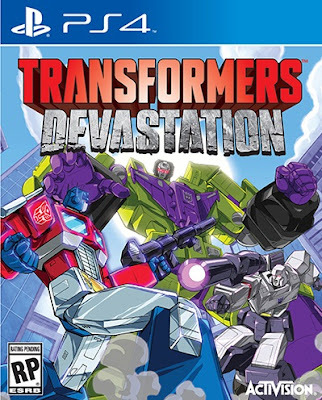 In recent times, we've seen games like Okami and Darksiders try their hands at dethroning Nintendo's storied series. Enter Oceanhorn. The game is an isometric affair akin to another Zelda-inspired game, Landstalker. With lots of blatantly inspired bits from The Legend of Zelda franchise, and some just blatantly copied bits as well, Oceanhorn tries to make for an intriguing Zelda game on iOS devices and Steam. In some regards, it very much succeeds, while in other avenues it doesn't hold up so well. 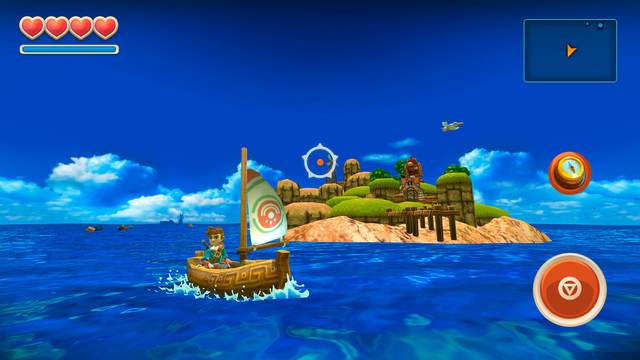 Oceanhorn: Monster of Uncharted Seas begins with you playing as a mute boy on an island occupied by a hermit. With help of said hermit, the boy is tasked with finding his father's sword and shield in a nearby cave. It's then that he is pumped and primed to go on a voyage around the sunken land of Arcadia to find his father's whereabouts and take down the monster that has been plaguing the land, Oceanhorn. The story elements are told well with some very nice voice acting, primarily done when you arrive at a new island and in post-boss story scenes. A lovely stroll about town is in order between exploring dangerous dungeons and creepy caverns. 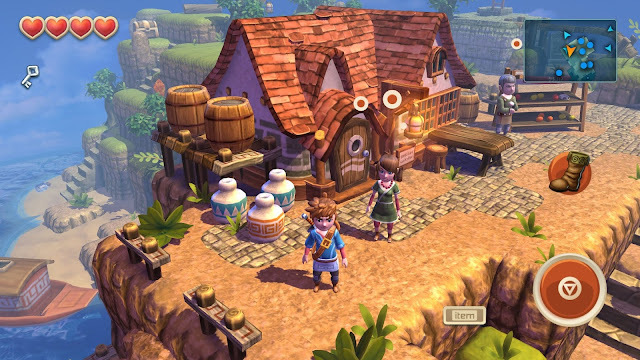 When you get acquainted with Oceanhorn's gameplay and particulars, you will know doubt see the striking resemblances between Oceanhorn and various Legend of Zelda games. For one, you travel in a boat, moving to and from islands in a land that was once above sea. Now, there are but a handful of pieces of land and remnants of the land of Arcadia that are still above water. Instead of freely being able to explore the oceans of Arcadia, you simply pick an already unlocked location (unlocked through talking with townspeople, coming across messages in a bottle, or through other means) and automatically sail to it. There is some interaction to be found through shooting oncoming enemies, mines, and barrels, but mostly the experience is much more passive than what'd you find in The Wind Waker. Ocean exploration is as deep as a puddle in Oceanhorn. Secondly, it's immediately apparent that beyond the isometric view that Oceanhorn possesses, that the game is a Zelda clone through and through. You can pick up jars and toss them against walls and floors to find coins and helpful pick-ups, you can cut bushes to find goodies as well, and you can even hold the attack button to perform a spinning slash, a la Link's spin attack. Then there's the means to add hearts to your health counter. Just like typical Zelda games, you're required to get four heart containers to add to your health. 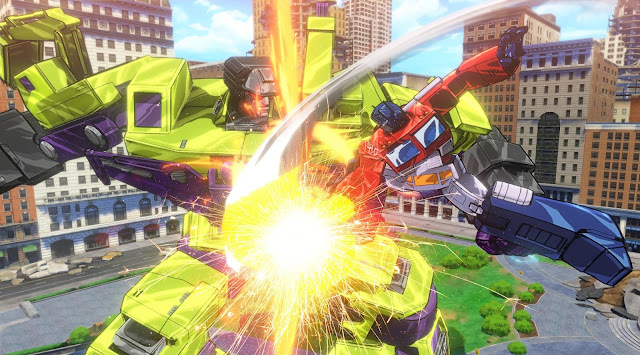 Spin attack and pose, a perfect combination! 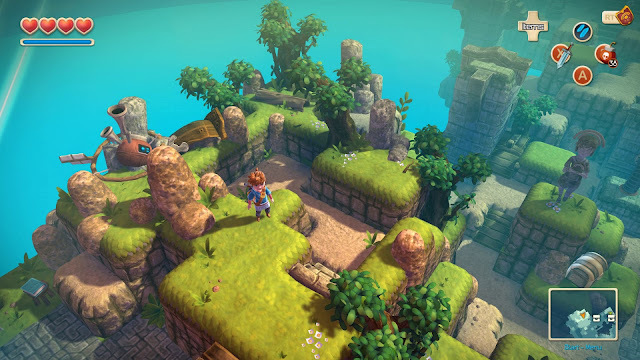 A good part of Oceanhorn is exploring the islands of the game, entering caverns and dungeons, and taking on the enemies and puzzles inside them. 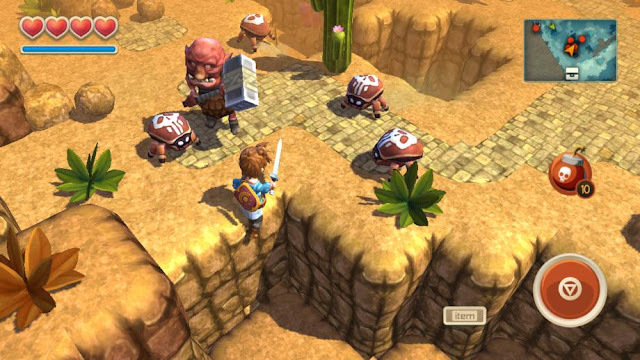 Most of the puzzles of Oceanhorn involve pushing blocks to the correct locations, whether it be on buttons to hold them down and keep doors open, or to use them as bridges to reach the other side of small chasms. The environments are generally lush and full of life. Like Zelda, dungeons are a big part of Oceanhorn, and the purpose of entering these is to find one of three special medallions that progress the story. 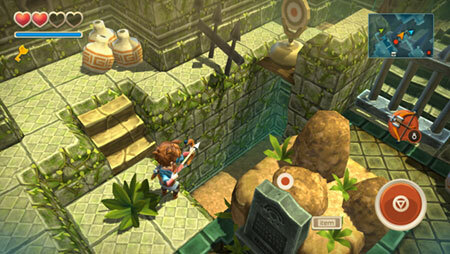 Dungeons feature the most puzzle and combat elements in Oceanhorn. There are ordinary keys to find to unlock doors, as well as big doors and chests that require a Master Key to open, usually giving you the dungeon's required item, such as a bow and arrow, bombs, one of five magic spells, or whatnot, or opening the door leading to the dungeon's boss. Let this arrow's aim be true. Each island and area is devised of numerous cliffs, up and down topography, and hidden goodies in the form of secret treasure chests and rare ores called Bloodstones. The main means of discovery is to find out how to reach each special treasure or Bloodstone by navigating the land proficiently. Perhaps you drop down from a higher-up area to land on the plateau where a treasure chest is. It's not just important to get treasure to assist you in your adventure, but it also goes a way to adding to your completion percentage in Oceanhorn. An optional but fun task in the game is to get 100% completion on each and every island through finishing off all tasks, opening every chest, and finding every Bloodstone. Surrounded, yes, but not surrendering! With Oceanhorn on iOS devices, the control scheme has you using a virtual joystick to move yourself around. 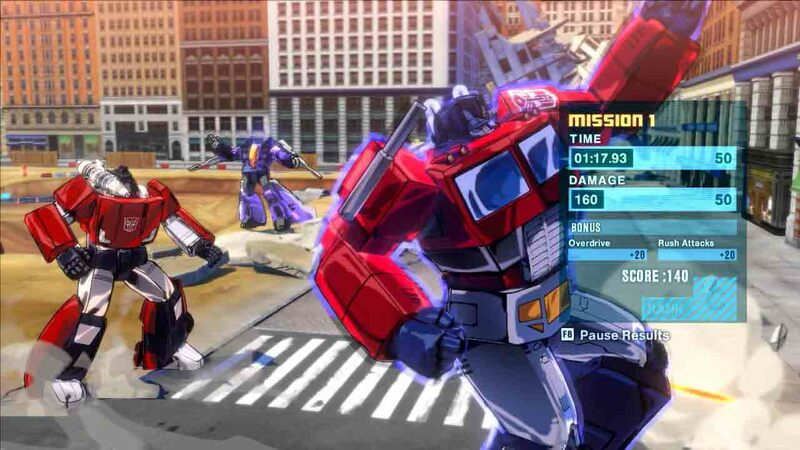 An attack button is available, as is an item button and means to open the item menu. Generally, tasks are built around this touch-based interface, making sure that no objective is made to be impossible to accomplish with these touch controls. Thankfully, if you're not in the mood to cover up the action with your thumbs, controller support is available for Oceanhorn. This is the way I played the game, and the controls worked wonderfully for everything I needed to do in the game. 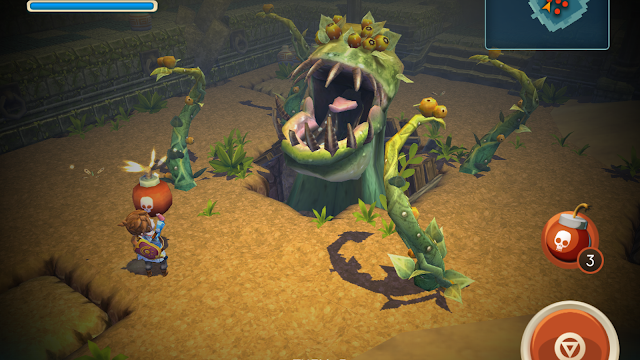 This boss is still angry for being passed over for a part in Little Shop of Horrors. Oceanhorn is a sizable enough adventure, especially for the price. The game has about ten hours worth of adventure to it, and that's not counting going for the before mentioned 100% completion on every island and outlet in the game. If you're looking for what The Legend of Zelda would be like if it were made for a mobile device, then Oceanhorn: Monster of Uncharted Seas is a good visualization. While it doesn't come anywhere near the highs of the Zelda franchise, it's a suitable substitute until Nintendo and DeNA come up with a way to play Zelda on mobile devices. For Steam users, there are better Zelda clones available, but Oceanhorn is still worth checking out. Though the gameplay and puzzles are simplistic and won't require too much thought, the game is quite the catch, to put it in fisherman on the old Arcadian seas terms. Time for another review for the month of January *officially* closes. This time we're embarking on a fun-filled adventure with Mario, Luigi, and Paper Mario, It's Mario & Luigi: Paper Jam, and it's SuperPhillip Central's newest review. Ever since his first outing on the Super Nintendo in the realm of RPGs, Mario has been a familiar face in the traditionally teenage-faced hero and heroine dominated culture of the JRPG scene. I'd take an Ultra Hammer over an Excalibur any day of the week. That said, not all of Mario's RPG outings have been stellar. His two latest, Mario & Luigi: Dream Team and Paper Mario: Sticker Star suffered from an exhausting amount of required tutorials and obtuse design respectively. However, now with his most recent outing, Mario & Luigi: Paper Jam, many of the problems that plagued those aforementioned games are gone, though some new ones do pop up. The latest Mario & Luigi features a much more simplistic story than past games. It's also much more cliche as well. When Luigi and a Toad are inside Peach's Castle's cellar, Luigi bumps into a shelf that opens up a magical book. In turn, this book unleashes a profusion of paper characters onto the Mushroom Kingdom, including the always silent Paper Mario. What happens next has both Bowser and Paper Bowser conspiring to and succeeding in capturing both Princess Peaches. It's up the team of Mario, Luigi, and Paper Mario to rescue them. While the kidnapping of Princess Peach (or in this case, Princess Peaches) is nothing new for the Mario series and is actually a step back story-wise for the RPG series, the true star of Paper Jam's tale is the colorful localization and humor. Furthermore, while past Mario & Luigi and Paper Mario games outside of Sticker Star have introduced multiple new characters, Paper Jam isn't as creative, instead using all characters from the already established Mario universe. This will no doubt disappoint fans looking for the next Mr. L, Fawful,or Don Pianta, but for me, it was nice seeing characters that I was familiar with take center stage. While there aren't new faces to find along Mario trio's adventure, each character that enters the picture is full of hilarious, sharp witted, and charming dialogue, one of the things I always look for in Mario RPGs, and it's here in Paper Jam. 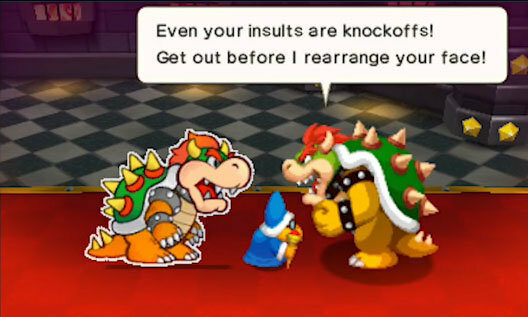 When it's from the mouth of Bowser, you can bet it's no idle threat. Mario & Luigi: Paper Jam's story has you traveling around the Mushroom Kingdom to six unique locations with sprawling maps to explore. Something that I personally found enjoyable was the lack of 2D side-scrolling areas with this Mario & Luigi sequel, making for more fun exploration. From grassy plains to parched deserts, tropical locales to specter-filled forests, Paper Jam offers a lot of foot travel for the Mario trio, and you're helped by Toads throughout the adventure. 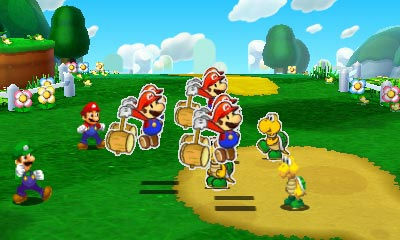 This is one of the key elements of Mario & Luigi: Paper Jam: rescuing Toads from capture or hiding. There are over 150 Toads to collect in Paper Jam, and each one is part of one kind of mini-game or another, another common element of the game. While it would seem tiring to collect Toads again and again, the scenarios are so different and varied that the act of collecting Toads seldom feels forced or tedious. Sometimes you'll have to carefully explore a closed off area, combing the area for hidden Toads; others you'll need to move towards Toads, urging them into an area like a cattle rancher; while others have you fighting to rescue the Toads. 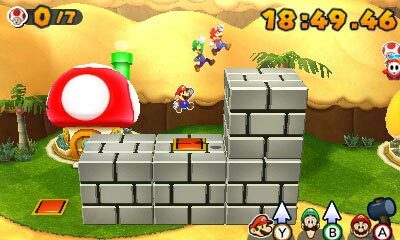 This along with a great amount of other mini-game types, whether it's chucking Bob-Ombs at an attacking Koopaling or trying to dodge attacks for a set amount of time, make for a lot of gameplay variety that is quite welcome and usually always fun in Mario & Luigi: Paper Jam. There is no time to lose when there are Toads on the loose! Additionally, there are special battles that pit your papercraft creation, created by the always adorable Toadette, against a myriad of other papercraft foes in combat. These battles have you charging into other enemies (particularly effective if you do it from behind them or when they're gearing up to attack), and then jumping onto them for the finishing blow as they lay on the ground. The battles don't take too long to advance through, but the need to recharge your energy through a simplistic rhythm game is a bit tedious. Craft an excellent battle strategy in these special papercraft battles. As for the actual traditional battles in Mario & Luigi: Paper Jam, these are typical Mario & Luigi affairs. 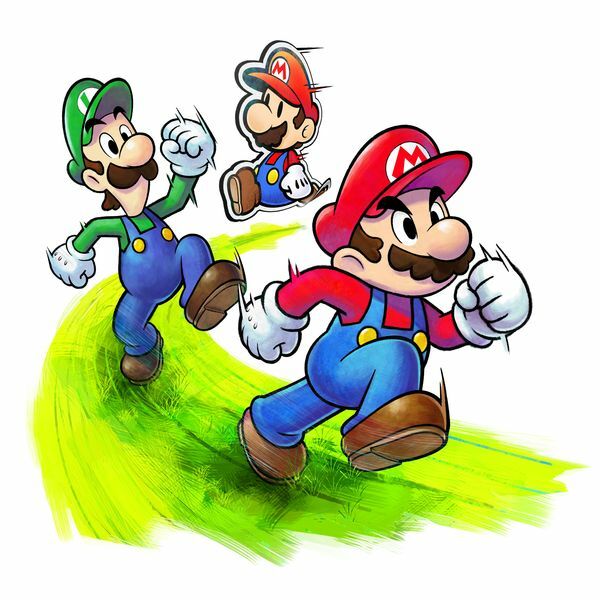 Much like exploring maps in the game, each member of the Mario trio is assigned to a button: A is for Mario, B is for Luigi, and Y is for Paper Mario. 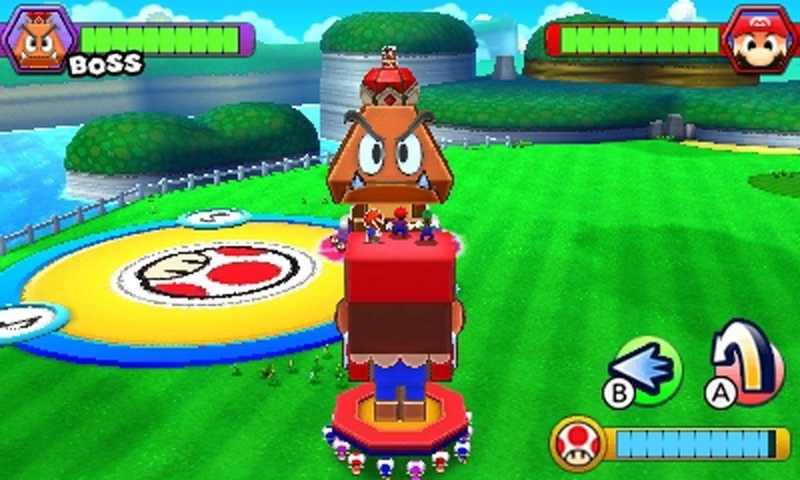 When you're exploring the numerous maps of the game, these buttons used in combination with one another allow the Mario crew to utilize different maneuvers to progress through the game, such as a giant hammer attack that can break large blocks, and a move that stands Mario and Paper Mario on top of Luigi's shoulders, stretching them out to grab faraway objects. You can even drill underground to move along floors and walls, as well as ride a makeshift Paper Mario airplane to cross large patches of terrain. Stretch out that flabby body of yours, Mario. In battle, it's the same thing, where the A, B, and Y buttons control each plumber. This is obviously utilized when the brothers attack, but also when they need to defend or evade enemy assaults. Like past Mario RPGs, the battle system in Paper Jam is timing-based. That is, that when you attack, if you time your button press to the exact moment you make contact with the foe, you do extra damage. Conversely, when dodging, it's important to not only evade at the right moment, but it's important to plan ahead and use an enemy's visual cues to know which of the Mario trio is about to be attacked. 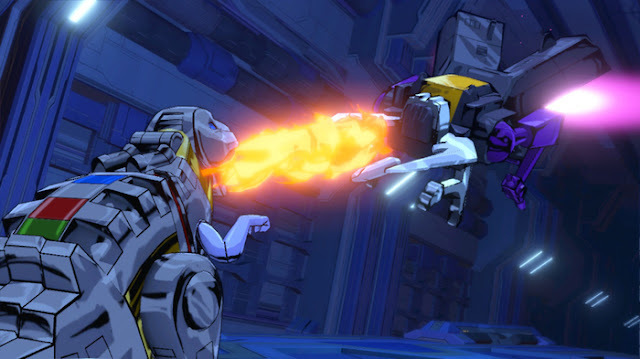 As Paper Jam progresses, the enemies attack harder and their offensive patterns are more difficult to anticipate and avoid. With more Paper Mario copies at your disposal, you can dish out even more pain. The bosses of Paper Jam are of course the ones with the most challenging attacks to avoid, plus they have the most amount of health points in the game. 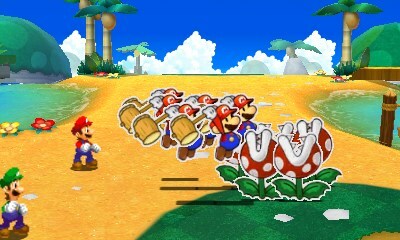 Many of these encounters have portions where Mario and Luigi will run towards the screen while being chased by a boss or handful of bosses. While you can use the A and B buttons to jump over small attacks with Mario and Luigi respectively, some require you to move Paper Mario, who takes the form of a paper airplane, over one of the plumbers so they can catch a quick ride, avoiding an otherwise impossible to evade attack. Use Paper Mario's abilities to hitch a ride when one of these two Pokey towers attacks. While regular enemies and powerful bosses have plenty of powerful moves in their arsenals, so do Mario, Luigi, and Paper Mario. The three are able to unleash moves together called Trio Attacks, that can devastate foes when pulled off correctly. 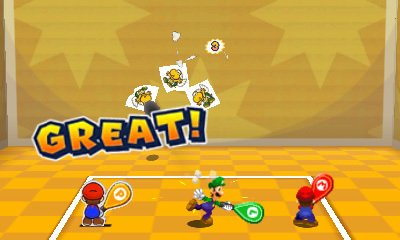 Trio Racquet, for instance, has the three plumbers playing a makeshift games of racquetball, launching a ball with proper timing against a wall where the foes are plastered upon. 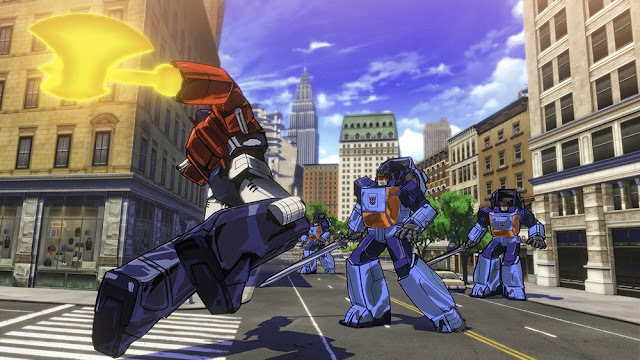 Like every move in the game, pulling it off well results in a congratulatory "Excellent" message, as well as the maximum amount of damage available for that move. Of course, Trio Attacks are the most powerful in the game, but because of this, each Mario trio member must be alive and status effect-free for them to be used. Alongside Trio Attacks are Bros. 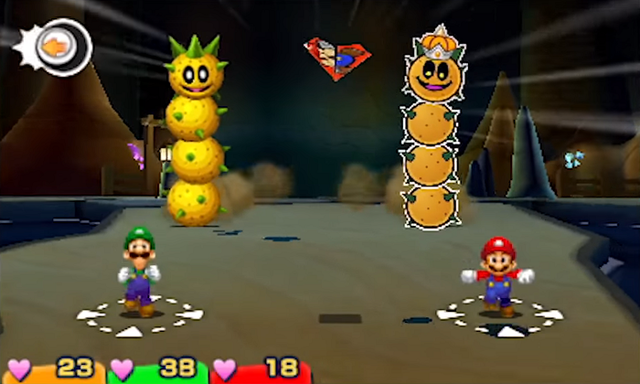 Attacks that return from past Mario & Luigi games, having Mario and Luigi use strong moves with BP, the magic points of Paper Jam, to unleash them. Like real racquetball, but without needing to let the boss win. After battles, the traditional RPG way is to earn experience. This is no different with Paper Jam. Unlike past games, when you gain a level, you don't get to choose which stat gets an extra increase. Instead, every handful of levels, you earn the ability to add a permanent upgrade to your character when they reach a level milestone. These are things as simple as increased power with every level increase to massively helpful things like a 25% extra damage increase when using hammers or jumping. With Paper Mario and various paper characters at the forefront of this edition of Mario & Luigi, you'd think there'd be a giant gameplay focus or at least some major elements from past Paper Mario games. This isn't really so, unfortunately. 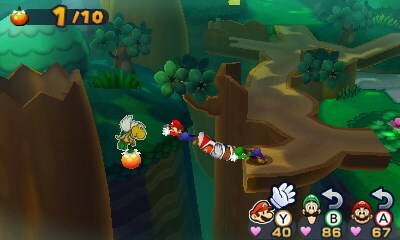 The paper elements are used sparingly, such as having Paper Mario be able to squeeze through certain gaps that the other characters wouldn't be able to do, for instance. The potential for partner characters as seen in both Paper Mario and its GameCube sequel was there, but this was squandered, which will no doubt disappoint longtime Paper Mario fans. 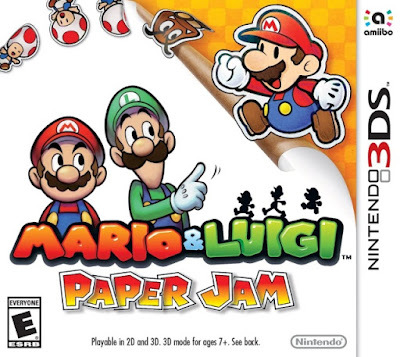 However, despite the sparing use of paper characters and abilities in Mario & Luigi: Paper Jam, the game is still a phenomenal effort. Specific alterations to the formula from past games make it a more engaging and enjoyable game. For one, the mandatory tutorials from Dream Team are a thing of the past. The tutorials instead can be accessed through a guide book in the main menu. Secondly, dialogue and story sequences can be slightly sped up by holding down the R button. This is fantastic for repeat plays, particularly if you want to try out the hard mode that gets unlocked after the initial play-through is completed. Despite only having six or so major areas in the game to explore, Paper Jam is a lengthy play. It lasted me just over 26 hours, but this was with finding all of the item boxes, bean locations, and collecting every Toad. It was enjoyable from beginning to end, which is something I haven't been able to say for a Mario RPG in a long time. Who knew it'd be Paper Jam that would give me that chance. Jumping on open-mouthed Piranha Plants is always a recipe for disaster, so use a hammer (or six). Mario, Luigi, and Paper Mario are a formidable team, and the game all three star in is a great deal of fun without ever feeling too much like busywork. The lack of original characters might put off some of the more dedicated to past Mario RPGs, but to me, I appreciated seeing old, familiar characters from past games like King Bob-Omb, the Koopalings, Nabbit, Chargin' Chuck, among many others. Collecting Toads can feel tedious at times, but generally each scenario in acquiring them is enjoyable and varied. Overall, the battle system is as good as ever, the story's dialogue is as snappy and well delivered as ever, and Mario & Luigi: Paper Jam's improvements on past games make it as fun as ever. Final Fantasy Explorers has been out in Japan for quite a while now. Fortunately, gamers in the Americas can now enjoy the game, and soon European players will get a chance to join them soon enough. Final Fantasy Explorers is an action RPG where you customize your character and do battle with familiar foes from the Final Fantasy series. Expect a review early next month! It's Monday, so that can only mean one thing. Well, aside from obvious things like most people going back to work or school. What I'm talking about is SuperPhillip Central's Favorite VGMs! I have for you a themed edition this week, an edition chock full of RPG goodness. This week we start off with some Ys I & II Chronicles music. 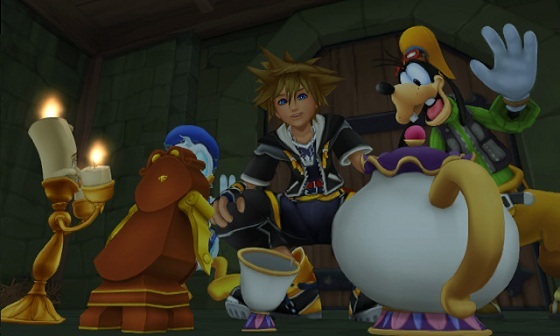 Then we enter into a waltz with music from Kingdom Hearts II. 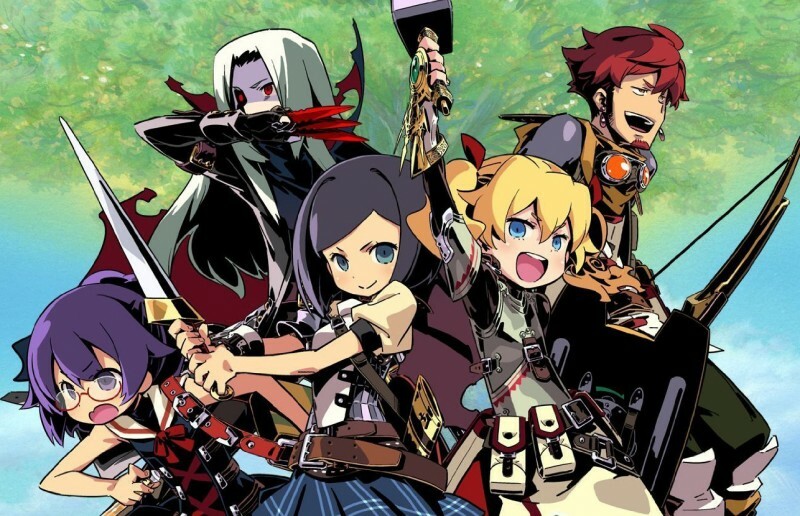 Etrian Odyssey IV: Legends of the Titan leads us to the halfway mark of this week's edition, while Chrono Trigger and Skies of Arcadia take us home. If after listening to the VGMs this week has left you yearning for more, check out the VGM Database, where more than 1,000 past VGM volumes are located for your listening pleasure! 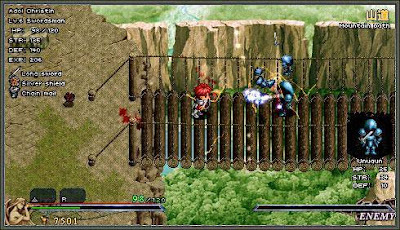 Yuzo Koshiro originally composed the themes heard in many early Ys games. Falcom's masterful arrangers took the already excellent compositions and turned them into even greater pieces with the Ys remakes. This theme, First Step Towards Wars, plays early in the first Ys game, which featured simplistic combat compared to future games in the series. Yoko Shimomura is a goddess of a game composer. That's not spreading it on too thick, is it? Her work in Kingdom Hearts 2 is fantastic, as exemplified by this theme that plays during the Beast's Castle level of the game, obviously modeled after Beauty and the Beast. Played in 3/3 time, as waltzes are wont to be, Waltz of the Damned is a magical and marvelous piece of music. We just can't get away from Yuzo Koshiro, can we? While we sampled a composition from his past works, his compositions on Etrian Odyssey IV: Legends of the Titan is much more recent, but no doubt just as capable and compelling. This beautiful travel theme for the Windy Plains area of Etrian Odyssey IV welcomes the listener with gorgeous strings and piano. We've already had some great composers featured on this RPG-filled edition of SuperPhillip Central's Favorite VGMs. Now I feature one of my favorite game music composers of all time, Yasunori Mitsuda. 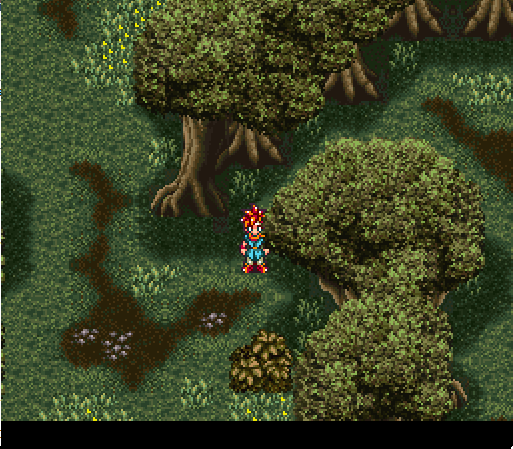 His work on Chrono Trigger was quite stressful to him, making it so he became ill during working on the music. Thankfully, the equally awesome Nobuo Uematsu of Final Fantasy fame came through and assisted Mitsuda with work on the soundtrack. 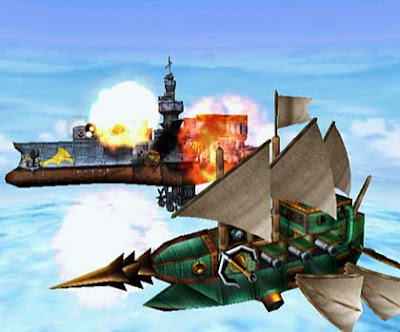 Vyse and crew travel the skies of Skies of Arcadia in a variety of vessels. The Little Jack is Drachma's ship and namesake, one of the earlier ships used in the game. Little Jack as a theme is heroic and majestic, great for soaring through the skies, passing by towns and clouds alike, as the adventure continues.